A perfect birthday cake for a young girl! 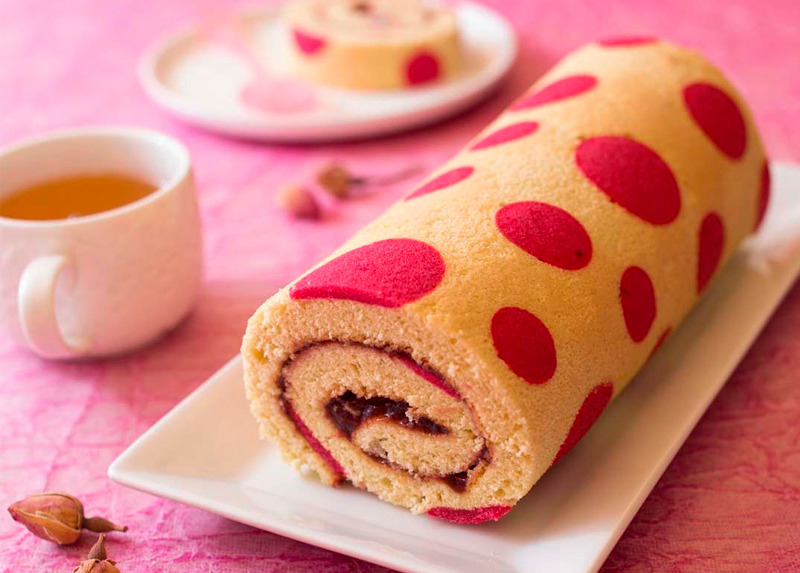 Garnished with strawberry jam and decorated with small pink dots, it is greedy and of the most beautiful effect! 2. In a bowl mix the melted butter with the icing sugar. Add the egg white then the flour. 3. Add the pink coloring powder little by little in order to obtain the color you desire. 4. Put the cigarette paste in a piping bag (otherwise in a freezer bag from which you will cut an angle). Let stand 10 min in the refrigerator to harden the dough a little (if it is too liquid, you will have trouble using it). 5. On a silicone sponge cake tin, make pink dots of different sizes. 6. Refrigerate the roll pan for 1 hour to harden the cigarette paste. 1. In a bowl whisk 2 yolks and 1 whole egg with half of the sugar. 2. Add flour and mix quickly. 3. Beat the 2 egg whites until stiff with the remaining sugar. Gently stir them into the rest of the mixture. 4. Spread the cookie dough on the sponge cake tin (24 cm x 34 cm) just out of the fridge and bake for 10 to 12 minutes in the oven preheated to 180°C. 5. As soon as the cake comes out of the oven, turn it once on a baking sheet or tea towel, then a second time on a tea towel and roll it so that it takes the shape. Let cool. 6. Roll out gently, spread the strawberry jam Insolite and Tradition and roll again. 7. Place the roll on the serving platter and cut the slices.